Hans Magnus Enzensberger was born in Bavaria in 1929. He is a member of that future generation, and The Silences of Hammerstein is a book about the implosion of the Weimar Republic and the rise of German fascism—but it is not a book about “reasons.” Enzensberger is not interested here in a synthesis of the facts. He offers very little explanation for the events that he describes. Even so, I think Joseph Roth would have appreciated the spirit of the enterprise. What Roth demanded above all was intellectual honesty. He wanted his readers to avoid the kind of explanations that made it possible to live complacently in a world that was falling apart before his eyes. Enzensberger has been an editor and a translator; he has written essays and a childrens’ mathematical text; but he is also a poet—he is often described as Germany’s greatest living poet—and it seems to me that The Silences of Hammerstein is a book that only a poet could have written. Form is just as important as content here. Enzensberger moves forward and backward in time, describes events out of context, and returns again and again to the gaps in the historical record. What emerges is a brilliant and horrifying representation of chaos. General Kurt von Hammerstein-Equord was the Chief of Army Command until shortly after Hitler rose to power. He is a fascinating figure—brilliant at a time when brilliance was likely to get him killed, open-minded in the face of militant institutional prejudice, a champion of “indolence” as a precondition of serious thinking—but he also functions well as an organizing principle in a book about Weimar Germany because of the political activities of his family members. As Enzensberger explains in a postscript called “Why This Book is not a Novel,” “via the story of the Hammerstein family it is possible to find and describe in a small space all the essential motifs and contradictions of the German emergency.” The general came from an ancient noble family; his daughters were active members of the German Communist party; two of his sons participated in the plot to kill Hitler in 1944; his father-in-law attempted a coup d’etat in 1920; and his wife and several of his children were imprisoned outside Buchenwald and inside Dachau. But what is the effect of the procedure that he has chosen to follow? We can begin to answer this question by asking others. Who was General Kurt von Hammerstein-Equord? Does this book give us a satisfactory answer? We have the simple facts. He was a baron of ancient Westphalian stock who rose to the highest rank in the German army. But another kind of answer hangs between the lines: it is everywhere suggested and nowhere plainly articulated that Hammerstein may have been the only man who could have opposed Hitler and steered Germany away from political, moral, and military disaster. Enzensberger does not commit himself to this idea. Instead, he organizes his material in order to allow for such an interpretation. The difference is important. We know that Hammerstein despised the Nazis. He is supposed to have said on more than one occasion that he would have fired on them had he been certain of the government’s support. 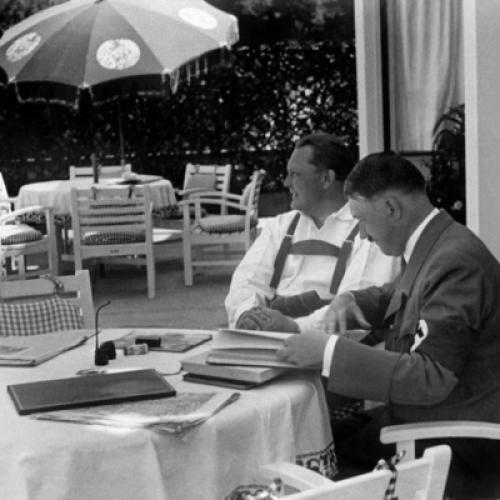 We know that he met with Hindenburg in order to advise against Hitler’s appointment as Reich Chancellor. Hitler himself was afraid of him and claimed that the general was plotting against his life, and there is evidence to suggest that when Hammerstein was re-activated at the beginning of World War II, he wanted to have Hitler arrested. If all of this is true, why didn’t Hammerstein take decisive steps? There are many reasons and no particular reason. He occasionally said that he didn’t think the army had any right to intervene in political matters. At other times he is supposed to have said that he didn’t want to take personal responsibility for “the pigsty” of the German government. Maybe it was just a question of missing his chance. Sources claim that Hammerstein planned to arrest Hitler during a proposed tour of inspection at the beginning of World War II, but the Fuhrer cancelled his visit at the last moment. It’s possible that the plot was real and that Hammerstein would have carried it out. It’s also possible that Hitler was aware of the danger. We’ll never know. Enzensberger never offers his own opinion on the matter. Here and elsewhere he would like to appear dispassionate. But I am not certain that we should credit his suggestion that The Silences of Hammerstein is more closely aligned with photography than with history, biography, or literature. To me it reads like a scrapbook that he has arranged with hysterical care and with a clear purpose in mind. As comprehensive as the book is, the Holocaust is conspicuously absent from it. This can’t have been an accident. Enzensberger is describing the events that led to the extermination of Jewish culture in Eastern Europe, and we have to wonder what it means that he does not confront the monstrous end of his own story. Questions such as “Why did it happen?” and “How could it have happened?”—the same questions that are constantly at issue in The Silences of Hammerstein—are most often heard in connection with the Holocaust itself. Saul Friedlander, in his introduction to a collection called Probing the Limits of Representation, remarks that “we are dealing with an event which tests our traditional conceptual and representational categories.” Jean-François Lyotard famously wrote that the Holocaust was like an earthquake so powerful that it destroyed the instruments of measure. Enzensberger’s insistence that The Silences of Hammerstein is not a novel speaks more to the vagaries of genre distinctions than to the substance of his book. Whatever it is, it is certainly an attempt at representation, and it raises the same questions and confronts the same problems as all representations. By avoiding the Holocaust, and by showing that the events leading to it present the same representational difficulties as the event itself, Enzensberger is making a disturbing claim: that the Holocaust may be exceptional in degree, but it is not exceptional in kind. It is a historical event, and if it challenges our understanding of what should or can happen, that is because our understanding is private and flawed. I wonder whether this agnostic approach to the telling of history is warranted, even when we discuss Auschwitz, but it is clear that Enzensberger wants to extend the same principle to all of history. In the end, this is a book about taking another look at everything, not just things that are hard to look at.